Protect your home's biggest door... control you garage door with Z-Wave enabled garage door monitor. Must have ADT Pulse Level III monitoring service to add Garage Door Controller. Price includes installation. 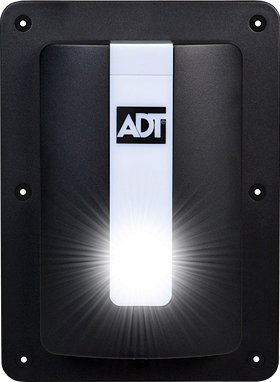 The controller unit that connects to ADT Pulse® via Z-wave will be located next to your existing garage door opener. Providing both audible and visual warnings prior to door movement, the GD00Z garage door controller meets UL 325-2010 safety requirements. These built-in measures (in addition to the safety features that come with the garage door opener) make this a safe way to remotely open/close a garage door, giving you complete garage door control. The Z-Wave Garage Door Remote Controller Accessory integrates with other ADT Pulse® Z-Wave enabled products, and can also act as a wireless Z-wave repeater to ensure that commands intended for another device in the network are received (useful when a device would otherwise be out of radio range). "I can't get over how much I love it and feel it was a great investment"
"From the first phone call to the last stage of installation, this has been a phenomenal company.... I called on a Monday and had a consult with Otis THAT DAY. Obviously when people want a security system, it is sometimes because something unfortunate happened. So I was super excited that they were so responsive and available. Otis was terrific and we pimped out my house in terms of automation and security. The very next day, Ron came and began the installation. Not finishing until it was totally perfect. Both Otis and Ron were consummate professionals and incredible to deal with. I may be moving this year, and I will absolutely use them to move and set up even more security. They are responsive, personable and patient. I also LOVE my system. I mean I show it to people on how I can arm from my phone and open and close my garage also from my phone. I live on four floors so it is so awesome that I can shut and lock doors from the fourth floor. Wow. I can't get over how much I love it and feel it was a great investment in my own laziness and my very real peace of mind. Run don't Walk." For more information or to schedule a free home security review call 1-800-310-9490.